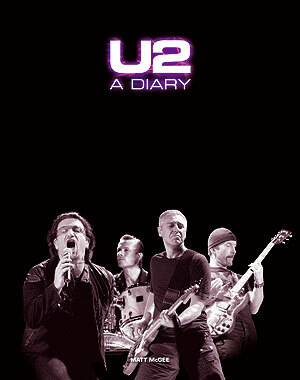 Last night at about 11:00 pm, I finished the manuscript and all associated documents for the 2nd edition of U2-A Diary! I’ll be sending Omnibus a little more than 40,000 words and the new book should be 400 pages total when it comes out this summer. But I have one last question for U2 fans. The Introduction as I’ve written it basically says that this was a difficult three years for U2 and that there were more negatives than positives. The question to you: Is that accurate/fair? Or, were the past three years better for U2 than I’ve painted them? Your feedback is appreciated! Please leave a comment below and I’ll process them for posting as quickly as possible. Thanks svein. The book covers all of the band members’ activities, and Spider-Man stuff is in it prominently. I think that more should be made of the 360 Tour and all of its successes. I also think that for me the last 3 years were wonderfall but that is probably due to me becoming a uber-U2fanatic in that span :D.
Yeah, i think this is definitely a fair assessment – i’d say a bands material is the most important thing, and considering how it sold relatively poorly, i could understand the band perceiving it as a failure… what’s more, the lacklustre response to the NLOTH songs live further shows how it isn’t truly loved by the fans. U2 dropping a lot of these songs from set lists is evidence that they’re losing faith in them. But then, on top of that, Bono’s back injury which delayed a tour leg and their much anticipated Glastonbury appearance must have been a kick in the teeth… added to that the stress of spiderman’s various problems, it seems the band have been suffering a lot of trouble and public criticism lately. Hell, even the 360 tour, while financially successful, is being criticised for being too over the top, and alienating. With the release of NLOTH, u2 were aiming to take a giant stride into a bold, brave, new musical world, and reclaim the throne of biggest band in the world. But they seem to have tripped up pretty badly. However, i think all of this is good – it will inspire the band to work harder, release even better music, be more creative in terms of promotion and reaching their audience, and maybe not even with the 5 year wait this time! I think NLOTH was good, but they played everything safe a bit… had it worked, they might have been convinced to rest on their laurels, but the hardships they’ve endured will mean they’ll have to find new and exciting ways to be the biggest and best… so i’m looking forward to what they have in store for us! Honestly, upon first-read your assessment above did leave me with a pretty negative view point of the last 3 yrs of U2-world. Whereas, I dont think i felt all that negaitivty while living thru the last 3 yrs. IMO the album release and response to singles was challenging for U2, but of course its to be expected as the music world is a different place. lack of grammys wasnt a big deal in my mind, as most fans actually wanted that less assessable type experiement from U2. What does stand out most to me is the re-claiming of the mantle with the success of the 360 tour. it could have been over-ambitious and a disater (i was fearing half empty stadiums, neg reviews), but it seems to be as successful in all aspects (not just attendence) as any tour they’ve ever done. Yes, the back injury was a setback, but it was handled great and i think every fan out there worried more for his health than any disrupted plans. Spiderman has to be menteined obviously, but in my mind its still more of a challenge for them right now, than anything specifically negative. In my mind it was more positive, but thats just my 2 cents. Hey Matt, one more idea might be the slew of high-quality/price re-releases and super-mega box sets they’ve been releasing over the past few years. Because the band is concentrated so much on accolades and sales, I’d have to agree with your assessment overall. If they were a band that just did what they wanted to do and let the chips fall where they may, I’d disagree, but that’s not today’s U2. This band is very concerned about all that they left behind. I “tend” to agree with your comments but they had a great launch of NLOTH. The U2 day that took over the BBC on 27 February 2009 was a work of marketing genius. Also their appearance at the Brit Awards 2009 was probably the best opening performance I have seen by any opening act and I think it set the mood fir a great award ceremony. I also think that they were shunned for any awards only because the release of NLOTH did not fall into the year of the awards. The 360 tour has also been outstanding, the band will have a very difficult time trying to emulate this tour. I cannot see another stage having the same impact for this band and it will be hard for any other band to follow that! Album sales comments should be in context of the market not previous sales numbers as the market has changed dramatically. In that regard U2’s sales can be seen a success, remember not even JT or AB were the best sellers in the years they were released. I must admit that is a fair summary of these past three years. It is a bit hard for me to admit that because I loved No Line On The Horizon and I thought it accomplished what the band set out to do with it beautifully. The reality was poor sales. I think this hurts the band but they won’t be too public about their real feelings. I also think the reaction to Spider Man was a blow to Bono and the Edge. I saw that and enjoyed it very much though. I thought they did an amazing job with the music in the show. For such a poor album response, the success of the 360 Tour is remarkable. I think the band saw the writing on the wall and changed the set lists with less No Line songs there to respond to what the fans wanted. They had to. I think your summary is fair, Matt. As a long time U2 fan, it just makes me a bit sad to comes to terms with it. Bono’s back injury was a reminder that they are getting older and so am I.
I think you have to be wary of ‘objective journalism’ to the point where you’re dissecting their hearts with a big and honest smile on your face to make money (ultimatly). Then walking away shaking your head if they object (or anyone else does). Would you like your artistic efforts and passions to be displayed for the world to see, with no cover or kindness? How would you like to be portrayed if you were in their shoes? If you can’t be gracious then don’t do it. You don’t deserve better. So don’t dish what you can’t eat with your own big smile still intact. (that just being a response from the sample you posted above) – it sounds a bit predatory to me. 1. Week on Letterman – The whole band doing the Top Ten and other skits was hilarious and unexpected. They showed they could laugh at themselves (Larry: even my family still asks me if I am Larry or Adam!) and it looked like they were all having fun. 2. NLOTH promo event at Somerville Theater – Nice to see the whole band talk more than usual, and the respect they had for each other and their audience really came through. 3. European leg 2010 – I saw a few great shows, and Brussels 2 was one of my favorite shows ever. I wish they were still playing more of NLOTH, but how cool to see unreleased songs live, and I really appreciated some old songs more after they got a break. Plus Miss Sarajevo amazes me every time. Bono can still sing! 4. End of 2010 European leg – At the show in Rome didn’t Bono say something like “And I for one feel very fortunate to be standing on this stage with my three best friends.” I found that really touching. Are there any other bands who have been together for decades and still said things like that? It seems like they are all still enjoying each other and us, and I think that is part of why millions of people are going to their concerts. I have been a fan for 24 years because of their integrity, passion, social/political messages, varied and usually great music, etc, not because they sold the most records/cds/downloads, and overall (while nobody is perfect and I have certainly been annoyed at times) they haven’t seriously disappointed me yet. I still think that the state of the band is strong. Seems grim. You’d never know from the headlines that these four guys have spent the past three years awash in cash and adulation. As mentioned above, because they measure their success through sales and awards, it sure hasn’t been their best of times. By the standards of any normal band, they’ve had extraordinary times. A few things that could be considered in their favor? * They’ve continued to experiment musically on tour in ways that they haven’t in decades, pulling songs from the back catalog and trying out new, relatively unrehearsed pieces. * Bono’s influence on the humantarian front continues to expand — as he’s picked up media outlets for his views and product Red has become almost ubiquitous. * Bono’s rapid and triumphant return from his back injury (okay, that’s just a respin of one of your points). * Set record for most previews in Broadway history and our gunning to become the highest grossing musical ever, even before the thing opens. I think that is a fairly reasonable assessment. I see the success of the tour overshadowing some of the things like poor album sales. I do think that the lack of a hit single was a big problem, although I am not sure that Magnificent of MOS would have done any better as the lead single. One part that your summary overlooks (but I am sure the updated book covers) is the stuff for “It Might Get Loud”. That was such a great look at the Edge and to the extent that the Spiderman stuff gets promoted and celebrated (or bashed), I think that the IMGL stuff also ought to be celebrated. The facts that you cite are indisputable. I’m not sure, however, of your analysis. Would the band members view 2008 through 2010 as difficult years? Disappointing would seem to me to be closer to the mark, but even there, you’re in the best-untouched world of personal outlook — unless you have quotes to back up your assessment. You can probably find some things along the disappointment end, but I don’t recall band members describing the events that occurred as difficult. And if there were enough good events in those years (e.g., personally, with family), they may even view the years positively on the whole. I think that you Matt wrote down a personal point of view on these last three years and it couldn’t be otherwise… but I disagree in seeing the success of our band only in terms of sales because we are fans, we know and understand U2 more than a journalist. NLOTH is still a great album with great songs, I find that it is too short each time I listen to it… meanwhile the “Bomb” for example is a little “empty” in my opinion. So it was a great “coming back” of the U2 I love, not only for Bono’s lyrics, but also for Adam and Larry’s job. The relative unsuccess of this album is mainly due to the “pop evanescent stars” that dominates the musical scene nowadays and to the wrong choice of the singles; I really disagree also with the choice of leaving NLOTH’s songs apart in the last legs’ setlists… the titletrack and Breathe should have become new milestones as New Year’s Day or Streets for me. I totally disagree with U2’s desire to connect with hip-hop culture: they come from a different world, I don’t like hip-hop at all and I think many other fans don’t. What they did to Sunday with Jay-Z is inconceivable and ugly! U2 should try to attract younger generations of fans with what they do best, that is with songs full of passion both in lyrics and in sound. Sorry, maybe I went a little off topic! It was just to explain that if U2 feel NLOTH as a not successful album, they have a wrong point of view, only based on money raised and no more on emotions aroused. I agree with what you said statistically, just looking at album sales and that being a disappointment, but then the record industry as a whole is dying a slow death. The 360 Tour has been a triumph, especially after coming back from Bono’s back injury. It all could have gone down the drain. I think from a personal standpoint (just watched the video from Davos), Bono is pretty much King of the World, so how does it get any better than where he is at personally, influencing the lives of millions of Africans? I used to be a fan of the music (still am occasionally). Now I’m a fan of the man. Most of what is in that paragraph is true, but then again, it is in the context of a music indistry that is on it’s knees with the collapse of physical cd sales, and illgal downloading issues. But it is true that the hits have not come, and the band have lost market share. The back injury is hardly a negative thing as that could happen to any band or artist at any time. It’s one of those accidental events. The Spiderman problems, are Bono & Edge issues, and not a U2 negative as such, as half the band are not involved in that project. However one major positive, is that U2 on the live front,is outselling all other artists, by quite a long way. My comments may be too late to matter, but I think you need to consider how much the music industry has changed when discussing their album sales. It would be unfair not to take that into consideration. My personal opinion is that NLOTH is a masterpiece. I haven’t looked at the sales #s, but I certainly wonder if they add up the various distribution methods / formats. So if that’s the measure of success, then then maybe it was positive, maybe it was negative, I don’t know. However, their business model includes touring and merchandising and the tour’s success may mean overall it’s positive. Hell, next time around maybe they’ll give away 10 million copies of their CD or perhaps free downloads to help push ticket sales (I’m only half kidding. If they manage to succeed on the Spidey front they’ll have moved on to a perhaps better business model as well. So, count me as business = positive. Artistically, phenomenal album, suffering only from not being a double album. The direct comparison for me is All That You Can’t Leave Behind – same “songs don’t hook me,” “it’s not what I wanted them to do,” “weak lyrically” and indifference (excepting Beautiful Day) AYTYCLB had from the bulk of the fans until September 11th and the words suddenly taking on new meaning for many people. No Line just hasn’t had that click moment for fans who are on/off switch, I like/I dislike people, rather than people who actively engage with art. So, again, positive artistically, it just hasn’t dawned on many fans as yet. Also wanted to say congrats on the contact with Mike Scott – I suspected he might help you out if asked. Great person. Highly recommend Still Burning if you haven’t heard that album. Also, on the new dates you unearthed – don’t know where I have it from (probably an early book) but I have Larry’s mom as dying in a car crash November 15, 1978. Your overview is quite correct; however I think the band is suffering from lack of reinvention in musical terms, but this is not just U2’s problem (look at REM). I suppose no band is a ‘big band’, as they would be termed in the 1980’s and early 90’s. Technology means that album sales have declined so U2 are doing what they do best – touring. A bit of a backlash at Bono (referred to as a ‘champagne socialist’) and moving U2 Ltd. to Holland did them no favours. It is noticeable at the gigs that Bono is preaching less (he is leaving that to Bishop Desmond Tutu) which is a good thing and concentrating more on the music. I don’t agree with the comment that the NLOTH songs are not going over well with the fans. Personally, I enjoy the album more now that I have heard the songs live. U2 will always be in or around the top in their game. The difficulty for them from now on is how to avoid becoming the Rolling Stones. Album sales are down all around so I don’t know how much you can count on this as an indicator of popularity. It wasn’t an album that grabbed me straight away with a bunch of hooky songs and that is fine. That means that I will have a long and wonderful relationship with this album as I have with all of their 21st century offerings. How much of sluggish sales are to be blamed on the economy and downward trending album sales for all of the record labels is hard to say but it could have been merely a matter of timing and external circumstance rather than reflecting U2s relevance in 2010. I wouldn’t know about singles for NLOTH, I cannot find any *TO* buy except “Artificial Horizon” and “I’ll go crazy….”. They certainly aren’t spitting out singles like they used to. Again, that is fine but as a fan and a collector, I want more. I assume that you are talking about the 2010 Awards season and not the 2011. Awards mean little to me as a fan so, I don’t pay attention to them. I feel for Bono performing with a back injury that is healing. What a trooper! The 360 tour is unlike anything I have seen in my 35 years of concert going. I saw the Rose bowl show in Pasadena. Aside from a very tall gentleman directly in front of me standing through the entire show, I have no complaints and it was as good (if not better) than any of the several other times I have seen them. The stage is incredible and I hope that they make a profit off of this venture. I must have cost a fortune. you forget the LV photo shoot disaster. As a fan, how many times i have to tell friends and colleagues that i too don’t get the point of this campaign, are incountable.